Home > KidsOut News > Curry and Quiz Night raises £1,000! Curry and Quiz Night raises £1,000! 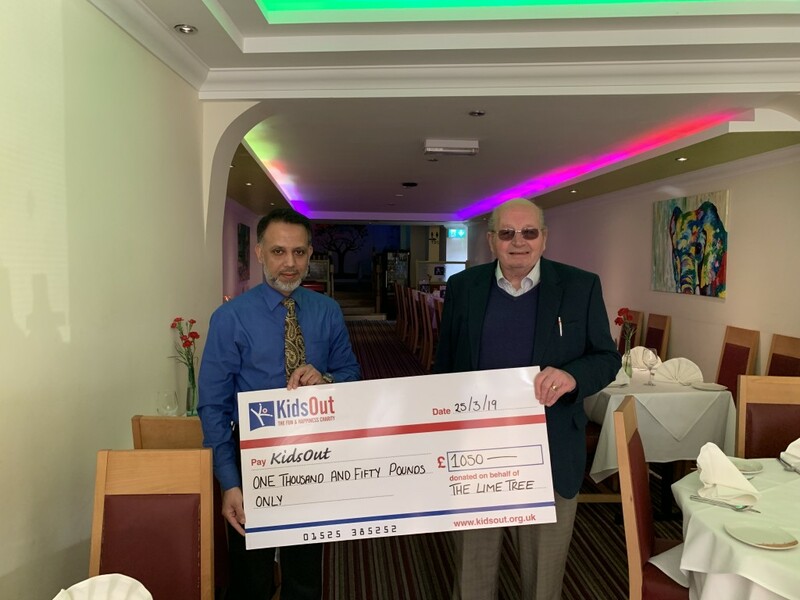 On Monday 25th March, one of Leighton Buzzard’s finest Indian restaurants, the Lime Tree, hosted a curry and quiz night in aid of the locally based charity KidsOut and the Town Mayor’s other chosen charities: Autism Bedfordshire and Macmillan Cancer Support. Guests were treated to a night of brain-tickling trivia and a sumptuous three-course gourmet meal that showcased the culinary skills of the Lime Tree’s chefs. KidsOut would like to thank all those who attended and supported the evening. Raffle prizes were generously donated by the following Leighton Buzzard-based businesses: Metalyika, Morrisons, Selections, T K Furniture, Majestic Wine Warehouse, Boots, Dees Cards, Waitrose, Halfords, Fabric World, Cee Jay, Reasons to be Cheerful, the Retro Centre, and Latte Dah. KidsOut were also grateful for the luxury hamper raffle prize supplied by Mr & Mrs Perham. Finally, KidsOut would like to thank Mohammed Humayun and the rest of the team at The Lime Tree for all their hard work and superb service and cuisine. KidsOut is a registered charity that provides positive opportunities and experiences to enhance the wellbeing and outlook of disadvantaged children, supporting them in becoming well-integrated members of society. KidsOut has called Leighton Buzzard its home since 1999 and provides its services nationally to over 50,000 children a year, mainly through the provision of fun days out and Toy Boxes for children rehomed after refuge. All the money raised for KidsOut from the curry night will go towards activities for disadvantaged children residing in the local area. Recent trips have included sessions at Smart Raspberry cooking workshops across the local area, Christmas parties at the Grove theatre in Dunstable, and recording sessions at Unit Nine in Milton Keynes. KidsOut hosts and organises a variety of local events and fundraisers throughout the year, including other quiz nights at Leighton Buzzard Rugby Club, a stall at the Canal Festival, the annual Santa Dash every Christmas, and much more. Be sure to check out the KidsOut website and social media channels for more information about upcoming local events. KidsOut are also always looking for new volunteers and people to join their Local Community Committee. If you think you might be interested, visit the KidsOut website or pop into their office on the High Street.